speaker right (internal impedance 33R) to ground. 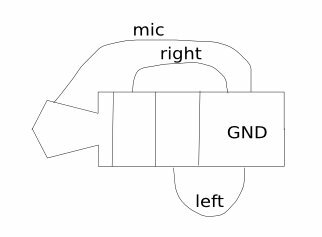 tip = mic electret condenser type, to ground. This matches the reported pinout for the Blackberry Pearl  but so far headset compatibility is unconfirmed. ( reading forum it seems right and left are reversed compared with freerunner ). The headsets used by Motorola smartphones (A780,A1200, ...) and the V-360 have a compatible configuration. The HS-120 (Motorola) works without problems (mic untested). TimoJyrinki MP35A pc-mobile.net Koss KSC-35 headphones, Altec Lansing inMotion iM4 speakers and car audio via AUX - all work great, if the mixer settings are changed like guided below. One can notice the lack of real quality sound with the headphones, but it's mostly fine for any casual listening. Definitely the output is not ideal/natural because of the high-pass filtering effect from the hardware issue and then artificially boosting low frequencies to compensate. jth 39691 Kjell & Company Sweden Works for me. Probably even better if I fix the capacitors. PWerken sku.3541 www.dealextreme.com It converts to stereo 3.5mm, so no microphone or button support. Some folks tried it but only got audio from one ear, Dealextreme might have swapped in a different model. sven1999 the OpenMoko headset www.pulster.de It seems to be the offical OpenMoko headset. The headsets used by some Nokia phones (N95, ...) have the same jack but they are incompatible. For technical information about rewiring them visit Analog wired Headset Nokia. The same is true for Headsets delivered with Sony Ericsson. Here is a short rewiring guide: Analog wired Headset Sony Ericsson. You probably want to fix mixer settings to overcome the poor low-frequency output, see FreeRunner Hardware Issues for instructions. This page was last modified on 26 September 2011, at 07:16.